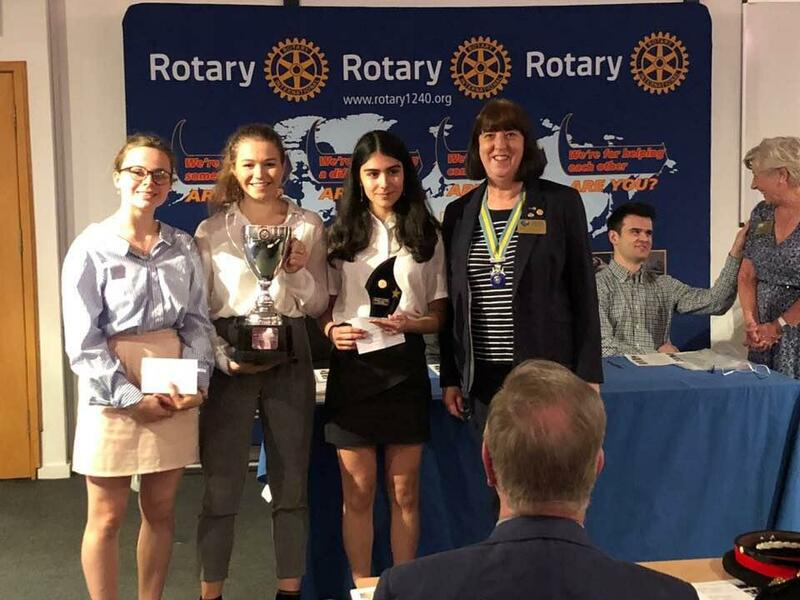 Teams from around our district of Beds, Bucks and Herts came together on two evenings to contest the Intermediate and Senior Youth Speaks District Finals. Winners now progress onto the Regional Finals and may even make the National Final. Another great afternoon at the Youth Speaks Regional Finals, brilliant presentations from all the teams and congratulations to the Senior team from Dame Alice Owen’s, who went forward to the National final. Sadly, despite an excellent presentation, the intermediate team, also pictured will not be in the National final. The Dame Alice Owen Senior team went on to become Runner Up at the National Final and have been asked to speak at the RIBI Showcase in Nottingham next May 2019. Again another brilliant, Inspiring and very entertaining evening. Other excellent presentation were from Dame Alice Owen's other team talking about "The importance of Creativity", Hitchin Boys School telling us about "The AI Revolution", Roundwood Park School, Harpenden arguing for "Votes for 16 year olds" and Samuel Whitbread Academy, Shefford persuading us "Should gender dictate fashion". Our thanks also to the 3 adjudicators at both Intermediate and Senior evenings, Mike O'Keefe, Marilyn Southgate and Sir John Southby. Finally good luck to our intermediate and senior teams going forward to the Regional final on Saturday 21st April, should be another enthralling event. This team will represent the District at the Regional Final on Saturday 21st April at Anglia Ruskin University, Chelmsford. Subject:- "Can we ever win the fight against modern slavery in the UK?"